The Doctor, a hero. The War Doctor - the version of him who turned his back on the name in order to do what had to be done. John Hurt returns as this enigmatic figure for a series set in Doctor Who's Time War...1.1 THE INNOCENT. As the Daleks mass their time fleet for a final assault on Gallifrey, something ancient is waiting for them at Omega One. And a sacrifice must be made. Arch-manipulator and Time Lord strategist, Cardinal Ollistra receives shock news of the Doctor's death. Meanwhile, on the planet Keska, a parochial war has returned to plague a peaceful civilisation after decades of tranquillity. But how can such a war have any connection with the great Time War which, at any one moment in the whole of eternity, could threaten to tear the universe apart? If only the Doctor were still alive. 1.2 THE THOUSAND WORLDS. With the high-ranking Time Lord Seratrix behind enemy lines, the War Doctor finds himself assigned to a rescue mission. But any room for manoeuvre is severely restricted by an area of space known as the Null Zone. Times have changed on Keska, and a countdown to destruction is beginning. But who are the Taalyens and what is their part in the great and terrifying Dalek plan? 1.3 THE HEART OF THE BATTLE. Trapped in a citadel swarming with Daleks, the Time Lord rescue force must find a way to overcome insurmountable odds. With the Daleks apparently planning to rule the Null Zone, perhaps their thirst for universal conquest and victory has been quenched...The War Doctor doesn't believe so - but how can he prove it without destroying any chance of peace? As the countdown to the destruction of Keska proceeds, a deadly choice must be made...A choice that will define this Doctor, and perhaps forever cast him in the role of 'monster'. Big Finish present John Hurt as The War Doctor, a character created for, and central to, Doctor Who's 50th Anniversary Special The Day of the Doctor, shown on TV and in cinemas in 2013. This release also stars two of cult television's leading women: Jacqueline Pearce known for her role as Servalan in Blake's 7, and Carolyn Seymour from Terry Nation's 1970s BBC hit Survivors. 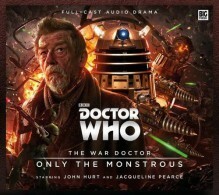 Only The Monstrous was written and directed by Nicholas Briggs - voice-artist for the Daleks and other terrifying monsters from the televised version of Doctor Who! CAST: John Hurt (The War Doctor), Jacqueline Pearce (Cardinal Ollistra), Lucy Briggs-Owen (The Nursemaid), Carolyn Seymour (The Slave). Beth Chalmers (Veklin), Alex Wyndham (Seratrix), Kieran Hodgson (Bennus), Barnaby Edwards (Arverton), Mark McDonnell (Traanus) John Banks (Garv) and Nicholas Briggs as The Daleks.